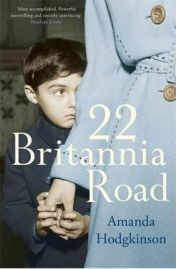 Silvana and Janusz Nowak are struggling to rebuild a family life together in a new country after years apart, in this beautifully written debut novel by Amanda Hodgkinson. They married in the late 1930s, settled in Warsaw and had a son, Aurek. Then both the German and Soviet armies invaded Poland and war was declared. He escaped to France and later, through service with the British Army, to England, while Silvana and Aurek have lived rough, foraging for survival. 22 Britannia Road is an end terrace house in Ipswich, England.